Hi! I’m Daisy Dreamer and my totally true imaginary friend Posey invited me to his amazing World of Make-Believe! Oh, and this time my best friends Lily and Jasmine are coming, too! Friends are the best. I mean, I don’t know what I’d ever do without Jasmine and Lily in my life. They stand by my side, always make me laugh, and are the best listeners in the whole wide world. We share everything. That’s why I’m inviting them to the World of Make-Believe! Isn’t that the best idea ever? Obviously. Oh wait, I have an even better idea. You should come, too! 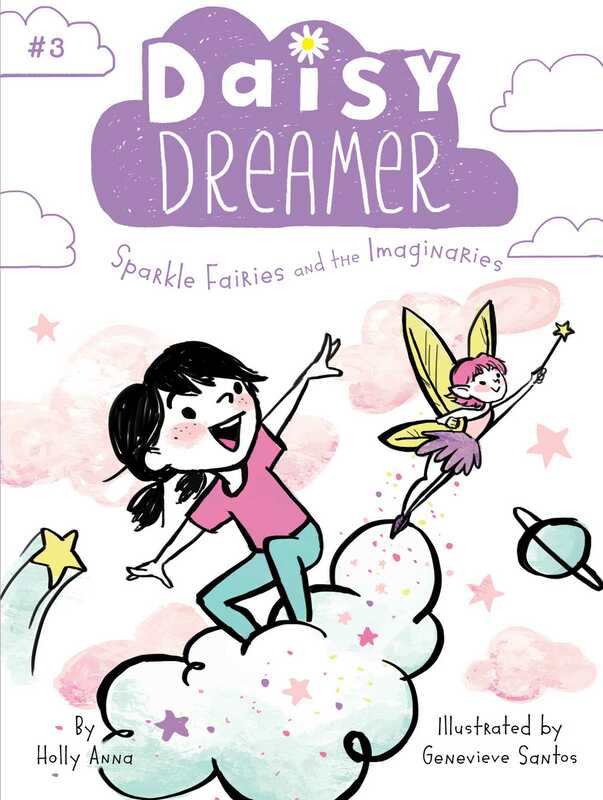 Posey, my totally true imaginary friend, is going to tell us all about the Sparkle Fairies and the Imaginaries. All you have to do is start reading! I’ll see you there! With easy-to-read language and illustrations on almost every page, the Daisy Dreamer chapter books are perfect for emerging readers. Holly Anna has always had a wild imagination. When she was little, she used to doodle drawings that would transport herself and her friends to a wonderful world of make believe. Now she visits other worlds through writing. Holly lives in San Jose, California, with her family. They have four cats: Rocket J. Squirrel, Le Mew, The Honest John Wookenchops a.k.a. “Wookie”, and Noel. Genevieve Santos is an illustrator born, raised, and living in San Jose, California, and sole proprietor of a small stationery company, Le Petit Elefant. Wanderlust got the best of her so she’s traveled to thirty-one countries before turning thirty, sometimes backpacking, sometimes by camper van, sometimes on her own, but always with a sketchbook. Her love for animation started at a young age, and is what drives her to draw the slightest observations. She also has an insatiable weakness for ice cream.